The Giants’ system is undergoing a bit of a sea-change in 2018, with some high profile acquisitions, some major setbacks, and a bevy of graduations. I’ve made a potentially controversial command decision with my midseason Top 50: I’m not going to include anybody currently on the major league roster in this list. That means that several players who have not yet lost their rookie eligibility — including Steven Duggar, Ray Black, and Dereck Rodriguez — won’t be factored in here. In my mind they have more in common with players like Andrew Suarez and Reyes Moronta who have tipped over the other side. All of the above players are highly likely to lose their rookie eligibility in the 2018 season and consequently I’ve set them off to the side to focus on the future. Age: 21, .304/.333/.870, 4 HR in 5 games in NWL (A-), the #2 pick in 2018 should move fast with combo of strong defense and RH power bat. Q: Does Joey Bart do this every day? Giants 2017 1st rounder has held head above water in challenging full-season assignment. Some of the highest tools in system, though he’s struggled to adjust to playing in new country in early going. The Giants handed out about $2.5 million of their IFA bonus pool to Luciano, who has huge RH power for teenager. Luciano was Baseball America’s #2 ranked prospect in this year’s International Free Agent market, effectively giving the team the #2 talent in both the domestic and foreign theaters for 2018. The Giants have been careful bringing Webb back from Tommy John surgery, and he’s rewarded them with big stuff, starter’s repertoire, and great performance. The big power is still showing up, but K rates over 35% in AAA are dimming his prospects, especially when combined with well below average defensive profile. Gonzalez’ story is similar to his fellow 2017 draftee Ramos, but many believe Gonzalez future could lie at 1B where his power bat will have to develop to its maximum value. The other half of the Nuñez trade with Boston, Santos is currently the second youngest pitcher in the college heavy short-season Northwest League. The 6’11” RHP from University of Kentucky was the Giants target for the 2nd round pick this year and they hauled him in. Will be the tallest pitcher in history if he makes it to the majors. The 2014 2nd rounder’s progress has been slowed by injury and he’s suffering through a brutal AA campaign. To make matter’s worse the Giants new #1 prospect plays his position and is expected to move fast. Fabian’s never been a toolsy OF prospect, so he’ll have to perform to continue to be promoted. He’s struggled badly in his introduction to A+. A rotation spot was his for the taking this spring, but a complete inability to throw strikes has landed him in Sacramento’s bullpen instead. Like Kyle Crick, it’s possible that relief is really the role to suit this mercurial talent. Other than Ray Black, nobody in the system can match Adon’s pure stuff, but at some point some consistent results will need to show up as well. As with Beede, an inability to throw strikes has moved Williams to a relief role for now. The Giants liked Rivera so much they drafted him in both 2017 and 2018. His Wallace St. Community College coach compares him to another former player — Craig Kimbrel. Howard plays a solid SS and shows an extreme contact approach at plate. That may be good enough to give him a UT profile but with 30 grade power it’s more likely an up and down profile. The athletic 2015 3rd rounder had precious little success in his first three years, but he had a big first half in a repeat of the Cal League. He’s still one of the league’s younger players but needs a big second half to show improvement is real. Read Howard’s comment again and insert Hinojosa’s name. Quinn is putting a brutal first full season behind him with an excellent repeat of High-A Cal League. The bat has to carry him wherever he’s going though, because there aren’t any other tools. The Giants spent their 3rd round pick this year on this strong armed Junior College RHP who performed at Grand Canyon College–just a couple miles from their minor league complex. The Utah high school two-sport star who was 2017 3rd round pick is repeating rookie league AZL, and showing much better control thus far. Another mercurial starter, Johnson owns the system’s best change and a low 90s fastball but he has struggled for consistent results. He’s recently been promoted to AAA. After two years struggling to make jump to full season ball, Geraldo is having breakout year as physical development and greater strength have helped turn tools into results. Definite possibility of a big league UT future. Injury has cut short breakout year for one of the organization’s fastest players and best defensive OF, who also has sneaky power. Returning from Tommy John surgery, Johnson has been limited to 3 inning starts and has yet to really show a putaway pitch as he tries to regain feel. Wolff had a breakout year in the Rangers system in 2017 but suffered flexor tendon injury in August that has kept him out most of first half. Potential to be a big velocity reliever in big league pen sometime soon. Unlike most teenaged OF prospects, Rincones doesn’t offer physical projection or great athleticism. The bat has to carry all the weight here — but some scouts believe it will as he’s shown advanced bat to ball skills in young career. The Giants’ surprisingly plucked Fernandez out of the Rockies system in the Rule 5 draft. The triple digit arm came close to making team out of spring, but then fell victim to Tommy John surgery. The talented left-hander has struggled to do two things as a pro: stay healthy and throw strikes. The Giants signed Cuban OF Pomares for $975,000 on July 2nd. The left-handed hitter has a very strong track record of hitting for Cuban youth national teams. Pomares was Baseball America’s #11 prospect in this year’s International Free Agent market. The Giants made Herb a surprising addition to their 40-man this winter, but he’s spent most of 2018 on the DL. There’s back-end rotation potential here. Picked up in a cash deal with the Yankees in 2017, McNamara is a sneaky power-armed bullpen piece who could potentially see a big league pen at some point. The 5’10” RHP out of UConn has put up some video game numbers in his career with K rates near 40%: 160 Ks in 108.2 IP as a pro with just 40 BBs. The talented but oft-injured Beltre has missed most of 2018 after fracturing tibia in spring training. Just getting back on the field. Coonrod will miss all or nearly all of 2018 recovering from Tommy John surgery. He had been moved from Richmond’s rotation to the bullpen just before his injury. Doval has one of the most special arms in the system, but very little idea how to use it. There’s an easy closer profile here if he figures things out. Marte has electric stuff — a fastball that gets up to 97 as a starter and a slider that can really bite when it’s working. Consistency and stamina are the next hurdles. A rotation mate of Marte’s, Cave also features some big fastball velocity and a wicked breaking ball, but struggles to get either into the strike zone consistently. Cabrera has been a valuable swing man in San Jose providing innings from both the rotation and bullpen. His curve is his trademark pitch, and though the fastball’s a little short there could be a lefty matchup profile here. 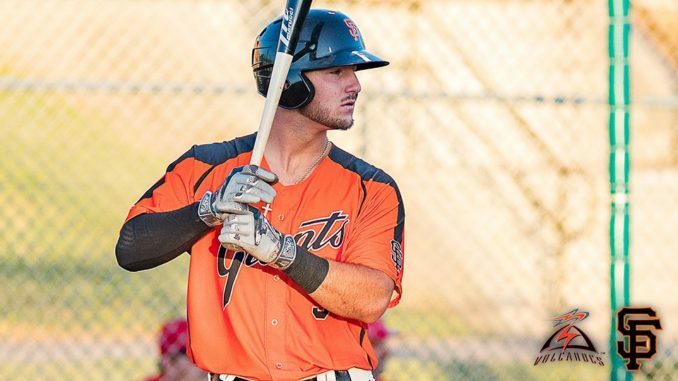 Like 4th round pick Blake Rivera, 5th rounder Winn was a repeat pick from the Giants’ 2017 draft. They know what they like! The Giants 6th round pick this year — and first high school pick — has tools galore, including an arm that could give him a backup plan as a pitcher if the bat fails to develop. The Sally League All Star has a curve that gets scouts attention, though the rest of the repertoire is on the bland side. Like his teammate Marciano, Gavin’s results in the Sally League have outpaced his modest stuff, though he flashes a nice change and knows how to use his pitches. The athletic Layer has always performed well when he’s been on the field, but staying there has been a struggle over his three professional seasons. The third member of the Giants big plunge into International Free Agency this month, the Venezuelan Matos was Baseball America’s #27 ranked IFA prospect. Parra has the makings of a solid defensive Catcher with some power. Genoves has a strong defensive reputation but his bat has a long ways to go. The Giants 11th round pick is a sleeper power prospect at the hot corner. Brusa has some of the biggest raw power in the system this side of Chris Shaw, but he’s struggled to hit consistently enough to use it. He’s attempting to convert to 1B in a repeat of the Cal League. Promising!!! I like it !! Nice ranking! Where would you have put Bahr, had he not been traded in the salary dump? Nice update on the prospects, do you have any early thoughts on Yorlis Rodriguez?